Grand Lake St. Marys State Park. COLUMBUS – With spring officially here, now is the time to start making plans to see wildflowers out on the trail! The Ohio Department of Natural Resources (ODNR) is offering some fun and free outdoor events scheduled at state parks and state nature preserves for people to enjoy in April. Fishing Fridays at Lake Hope State Park – Join the naturalist for an evening of free fishing fun every Friday night at 6 p.m. in April! Some poles and bait will be provided. People over age 16 must present a valid fishing license. Meet at the Lake Hope dam. For questions, call the nature center at 740-596-3030. Birds of a Feather at Burr Oak State Park – Join the naturalist at Burr Oak State Park on Saturday, April 7, at 9 a.m. for one of nature’s most exciting annual events–the spring migration of birds. Bring binoculars or borrow a pair from the naturalist, and “flock together” to search for these world travelers. Meet at the lodge. For more information, call 740-767-3570. Explore Biodiversity on Buckhorn Ridge at Shawnee State Park – Join Julie the Mushroom Lady and the Adams County Wild Mushroom Club for a trek out on the longest ride in Shawnee State Park. Meet at 9 a.m. in the lodge lobby on Saturday, April 7. Be prepared for an all-day 7-mile hike. Hikers should pack a lunch and water, dress in layers and wear sturdy hiking shoes. For more information, call 740-858-6652. Bunny Hike at Portage Lakes State Park – Join us for a beautiful day out on the Rabbit Trail at Portage Lakes State Park on Saturday, April 7, at 10 a.m. As we “hop” along this trail, we will keep an eye out for the wildlife that inhabits the woods. Meet at the large parking lot on the right when entering the park. For more information, call 330-644-2220. Wetland Wade at Lake Hope State Park – Explore what creatures live in a wetland and how important their role is in the ecosystem on Saturday, April 7, at 10 a.m. at Lake Hope State Park. Wear rain boots. Some nets and buckets will be provided. Meet at the Hope Furnace. For questions, call the nature center at 740-596-3030. Early Bloomers at Burr Oak State Park – We will search a woodland trail for early blooming spring wildflowers peeking up from the forest floor at Burr Oak State Park. Meet at the nature center for this 1.5-mile hike on Saturday, April 7, at 2 p.m. For more information, call 740-767-3570. Easter Egg Hunt at Salt Fork State Park – The public is invited to participate in the annual Easter egg hunt at Salt Fork State Park on Saturday, April 7, at 2 p.m. Meet at the camp check-in for the hunt. Spring Wildflower Hike at Clifton Gorge State Nature Preserve – The spring ephemerals are likely the best feature of Clifton Gorge State Nature Preserve, and the relatively untouched forest found on the dolomite slopes here have allowed these colonies of wildflowers to flourish. Join us on Saturday, April 7, at 4 p.m. for this spring wildflower hike and learn about some of these short-lived beauties. Sturdy footwear is recommended. Hikers should meet at the Bear’s Den, which is near the main parking lot trailhead. The parking lot address is 2381 State Route 343, Yellow Springs 45387. For more information, email michelle.comer@dnr.state.oh.us or call 937-537-6173. Nature Night at Maumee Bay State Park – Ever wonder what animals roamed the wilds of Ohio? Or lurked in the Great Black Swamp? Swing by the lodge at Maumee Bay State Park to find out each Saturday in April at 4:30 p.m., and see some skins, skulls and snakes! For more information, call 419-836-7758. Canal Cabin Fever Run/Walk at Grand Lake St. Marys State Park – Grand Lake St. Marys State Park has partnered with the Heritage Trails Park District to put on a 5K walk/run located on the towpath beside the canal on Sunday, April 8. Registration is at noon at the Noble Township House, located at 16585 County Road 66A (also known as Brewer Road), St. Marys 45885. The 5K begins at 1 p.m. and ends at 3 p.m. The direction of the 5K depends on the weather that day. Runners/walkers will go halfway and turn back to the Noble Township House for the 5K. For more information, call 419-394-3611. Archery for Beginners at Burr Oak State Park – Interested in trying archery? Join us at Burr Oak State Park, all of the equipment will be provided. Children must be accompanied by an adult. Meet at the lodge shelter house from 3-5 p.m. on Friday, April 13, and Friday, April 20, to participate. For more information, call 740-767-3570. Helping Hands Clean-Up Day at Mosquito Lake State Park – Looking for a great volunteer opportunity? We are looking for volunteers! Meet at the Mosquito Lake State Park office on Saturday, April 14, around 8:30-9 a.m. to register. Volunteers should bring gloves, wheelbarrows, rakes, shovels, etc., and dress for the weather. We will be cleaning up roadways, parking lots, trails, picnic areas and campgrounds. A “thank you” lunch will be served to all volunteers at the Beach Pavilion at 1:30 p.m. People are asked to pre-register by calling Renee Hendrickson at 330-979-8764. This event is hosted by the Friends of Mosquito Lake State Park and the Geauga-Trumbull Solid Waste Management District. Ephemeral Stream Study at Eagle Creek State Nature Preserve – Ephemeral streams are small seasonally wet streams that meander through the forest. These streams provide the necessary habitat for many plants and animals as well form the headwaters for our larger river systems. Join us on Saturday, April 14, at 10 a.m. at Eagle Creek State Nature Preserve as we explore in and around these interesting streams. No registration is required. Muck boots are recommended. For more information, call 330-527-5118 or email adam.wohlever@dnr.state.oh.us. Spring Wildflower Hike at Miller Nature Sanctuary State Nature Preserve – This spring hike at Miller Nature Sanctuary State Nature Preserve will showcase one of the best viewing locations for spring wildflowers in the area. Enjoy a large waterfall, rock arches, Virginia bluebells and trilliums in bloom along a beautiful stream. Meet at 10 a.m. on Saturday, April 14, at the parking area in the interior of the preserve – Barrett Mill Road in Hillsboro. The preserve is located a half-mile west on Barrett Mill and the Cave Road intersection. For more information, call 937-544-9750 or email joshwa.deemer@dnr.state.oh.us. Water Wise at Shawnee State Park – Acquire new skills or brush up on old ones with Shawnee’s naturalist at the lodge indoor pool at Shawnee State Park on Saturday, April 14, at 10 a.m. Paddling, nautical knots and water safety are the themes of this fun water program. Bring a bathing suit and prepare to get wet. Attend four programs and receive a free hour of kayaking. For more information, call 740-858-6652. Wildflower Walk at Lake Hope State Park – Join us for a wildflower walk at Lake Hope State Park on Saturday, April 14, at 10 a.m. Meet at the Hope Schoolhouse, we will then caravan to the Moonville Tunnel. The walk is less than 1 mile. For questions, call the nature center at 740-596-3030. Whipple Wildflower Walk at Shawnee State Park – Discover one of the area’s most colorful displays on this amazing walk through Whipple State Nature Preserve, where wildflowers blanket the earth among dolomite rock cliffs with breathtaking views of the Ohio River. This is a moderate 2-mile loop. Pack a lunch, dress in layers and wear sturdy hiking boots. Meet at the lodge lobby of Shawnee State Park on Saturday, April 14, at noon. For more information, call 740-858-6652. Blooming Beauties at Burr Oak State Park – Join the naturalist at Burr Oak State Park for a 2-mile hike as we identity and enjoy woodland wildflowers. Meet at the Tom Jenkins Dam on Saturday, April 14, for a 2-mile hike at 2 p.m. For more information, call 740-767-3570. Spring Woodcock Walk at Maumee Bay State Park – Witness the spectacular courtship flight of the “timberdoodle” as the American woodcock is sometimes known. Meet at parking lot 7 (youth fishing pond parking) at Maumee Bay State Park at 7:45 p.m. on Saturday, April 14. Make sure to call 419-836-9117 beforehand to make sure the program is occurring because it is weather dependent. Archery at Lake Hope State Park – Learn how to shoot or perfect your archery skills at Lake Hope State Park on Sunday, April 15, from 1-3 p.m. Meet at the archery range near the shelterhouse. All equipment will be provided. For questions, call the nature center at 740-596-3030. To learn more about family-friendly events at Ohio’s state parks and state nature preserves, go to parks.ohiodnr.gov/calendar or naturepreserves.ohiodnr.gov/calendar. Getting outdoors is an ideal way to relieve stress and boost mood levels. The Explore Ohio initiative is aimed at encouraging people to exercise outdoors and become healthier in the process. Participants can log their miles, share their photos and create friends groups on the Explore Ohio website at ExploreOh.com. Whether people are running, hiking, biking, climbing, walking or paddling, Ohioans can keep track of their progress at ExploreOh.com and share their adventures on social media using #ExploreOhio. After reaching 100 combined miles of activity on the site, each registered user will receive an email with a certificate good for 15 percent off camping at any Ohio State Park. 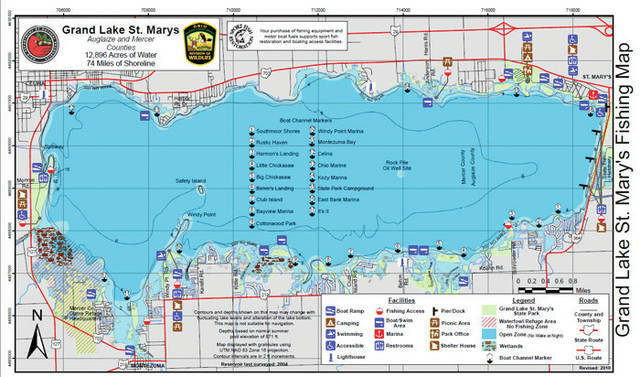 https://www.sunburynews.com/wp-content/uploads/sites/48/2018/04/web1_grandlakeenhanced.jpgGrand Lake St. Marys State Park.